Creating a certified working cell bank for important cell lines in your research program | Bionique® Testing Laboratories, Inc.
Mutational changes, aging and evolution continually occur in all actively growing cell cultures. The longer cultures are maintained and passaged, the more these changes accumulate. As a result, cell cultures often lose important genotypic and/or phenotypic characteristics, such as biochemical features and alterations in functional properties. These variations compromise the reproducibility, reliability, credibility and proper application of any experimental results produced from continuous cell lines maintained beyond safe passage levels (Coecke et al., 2005; Hughes et al., 2007). Cell lines derived from tumors or those which have been genetically engineered are particularly prone to genetic alterations. Besides the impact on cell line characterization, the use of over-passaged cell lines poses an increased risk of microbial, viral or cellular cross-contamination. Key steps for controlling these problems and achieving cell line ‘provenance' or standardization are establishing and carefully maintaining frozen cell stocks for all critical cell lines (Freshney, 2002). Frozen stocks of early passage cells can provide the assurance of a homogeneous culture supply as well as provide an important retained backup supply for replenishing occasional losses due to contamination or accidents. These practices are among some of the key recommendations in the Bionique® Safe Cells™ Program. Fortunately, cryogenically preserved cultures do not undergo any detectable changes once they are properly frozen and stored below -130°C. Therefore, the biological effects of in vitro cellular aging and evolution may be minimized by periodic regeneration from your frozen stock cultures every two to three months depending on your needs and situation. This approach allows ongoing long-term culture experiments to be successfully completed without these unwanted variables. In addition, the process of establishing a certified working cell stock enhances the value of the cell line by ensuring suitability for validation studies of the cell line in the event of industrial applications (Freshney, 2002). Ideally, each frozen cell stock would contain enough vials to provide fresh cultures for as long as needed. Since it is difficult to predict future needs for any individual cell culture, a large cell bank would be needed to prevent depleting the cryopreserved stock. Unfortunately, processing enough cultures to make a large pool and then freezing the cells under identical conditions is an impractical task for many laboratories. 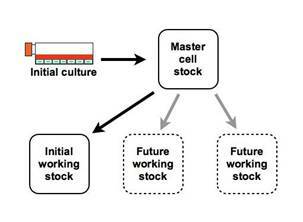 Figure 1 - A two stage approach using both a master and working stock is more practical and flexible for cell banking.nes. Rather than growing up a single large batch of cells and pooling them to create a bank of hundreds of frozen vials, a two stage approach is employed. In the first stage, a smaller amount of cells is grown, harvested, pooled and frozen to create a master cell stock containing only ten to twenty vials. Then from this master stock, a single vial is thawed and cultured (one to two passages) until there are enough cells to produce the initial working cell stock, also containing only ten to twenty vials (Figure 1). At this point, the working stock must be thoroughly tested to ensure their quality. One vial is recovered from the working stock and carefully tested to verify the following: 1) Viability; 2) Absence of mycoplasma or other microbial contaminants; 3) Cell line identity; 4) Important cell line characteristics (Coecke et al. 2005; Freshney, 2004; Stacey, 2004). Future needs for these cells are then met by drawing vials only from the working stock. Once the first working stock has been used up, a second working stock is produced by thawing another vial from the original master seed stock and repeating the process. A vial from this new working stock should be tested in the same manner as the original working stock. Additional working stocks can be produced from the remaining master seed stock vials as required. Once the working stock has completed the validation process, it is important to record as much information as is available about the culture's characteristics, requirements and results. Keeping good records is often overlooked as part of maintaining a frozen cell repository (Coecke et al. 2005; Freshney, 2002; Stacey, 2004). Keep in mind that these cell stocks often out last the workers who created them so documents and records must be clear and self explanatory. This is especially important if the working stock or cell bank may be used for many years. 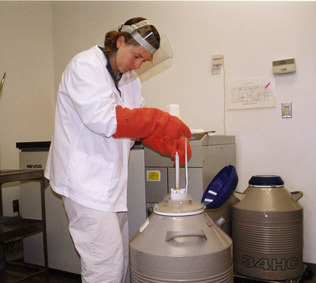 Figure 2 - Laboratory workers should routinely check the amount of liquid nitrogen remaining in a freezer. Last, but not least, be prepared for emergencies. Accidents and mistakes involving liquid nitrogen freezers resulting in culture loss are all too common events (Stacey, 2004). Frequently check nitrogen levels in freezers. Schedules for filling and procedures for maintenance of nitrogen storage vessels should be in place (Figure 2). Alarm systems for detecting low liquid nitrogen levels are also available to provide additional safeguards. However, they provide a false sense of security if not monitored 24 hours a day. Valuable or irreplaceable cultures should be stored in more than one freezer preferably placed in at least two separate facilities. The next section outlines the steps for establishing cryogenic cell stocks which meet the Safe Cells™ requirements for your research program. Figure 3 - Setting up master and working stocks with ten vials in each provides a cell bank with a potential 100 vial capability but requires less storage space than a traditional cell bank.cultures at once often leads to mistakes, damaged cells and vials that have poor recovery rates. The two stocks do not need to contain the same number of vials. Since, this is a flexible approach, it is possible to simply increase the number of vials in future working stocks if the demand for the cell line increases. It is also very important to freeze the vials under reliable and reproducible conditions by using a freezing unit which provides a controlled cooling rate. The following procedure creates both a master and a working cell stock with ten vials in each for a cell culture that is expected to play an important role in a laboratory research program (Figure 3). This master cell bank will have the capacity to generate nine additional working stocks of frozen cells over its lifetime. This will only require growing 2x107 cells (approximately four 25 cm2 flasks for typical cell cultures) to create the master cell stock and an equal number of cells to produce the first working stock. Before freezing, the cells should be actively growing to ensure maximum health and a good recovery. Ideally, the culture medium should be changed the previous day. It is best if the cultures are maintained in antibiotic-free medium for at least two weeks prior to cryopreservation. This practice of antibiotic-free cultivation is recommended to help reveal any cryptic (hidden) or low level microbial contamination within the cell culture system. (See long-term use of antibiotics in cell cultures for more information). The avoidance of antibiotics will enhance the reliability of quality control testing in step 5. Consequently, the use of antibiotics should be avoided when establishing cell banks, wherever possible (Coecke et al., 2004). Harvest, count and pool the cultures quickly but gently to reduce cell stress. Pooling the cultures is essential to ensure the uniformity of the cells added to each vial. Fill ten prelabeled vials with 2x106 cells each and place them in the freezing device. (Sensitive cell cultures may recover from freezing faster if more cells are placed in each vial; the number used here works well with most mammalian cell cultures.) It is very important to work quickly during the entire procedure to limit the stress on the cultures. When the freezing process is finished, transfer the frozen vials quickly to their final storage location in a liquid nitrogen freezer. This is a critical step because it is easy for vials to warm up during the transfer from the controlled rate freezing device into the liquid nitrogen freezer, especially if they were initially frozen to -70° or -80°C. Placing the vials in an insulated container on a layer of dry ice or in a small amount of liquid nitrogen during the transfer to their final location is strongly recommended to avoid thermal damage to the cells. Remove and thaw one vial from the frozen master cell stock into a 25 cm2 flask. Carefully check its recovery and growth. If all appears normal, subculture the flask when it is nearly confluent into four new 25 cm2 flasks. Harvest and process these flasks when they are nearly confluent to obtain at least 2x107 cells and follow the same procedure (Step 3) as for the master cell stock to create the first working stock. Remove and thaw one vial from the frozen working cell stock into a 25 cm2 flask. Carefully evaluate the success of the cryopreservation process with viability and functional assays (Stacey, 2004). If the results of these assays are acceptable, then proceed with quality control testing including sterility and testing for mycoplasma. (There are several testing methods available for detecting mycoplasma in cell cultures. Find more information on choosing the best mycoplasma testing approach for your cultures and scientific needs here.) The next step is to confirm the identity of the cell line. The use of misidentified cells or cultures which have been cross-contaminated by faster growing cell lines, such as HeLa cells, is a well documented problem (Hughes et al., 2007). The most reliable procedures to determine authenticity are DNA fingerprinting or isoenzyme analysis. Chromosomal analysis can also be useful for identifying the species of origin in a normal cell line. Aneuploidy and heteroploidy in transformed cell lines reduces the usefulness of karyotyping for species identification for these cultures (Freshney, 2000). Part of the validation process also includes performing specific assays which demonstrate that your cultures have maintained all their important characteristics. When a culture from the working stock has passed all of the above evaluations then the remaining vials in the working stock can be considered validated since the cells originated from a common pool and were handled under identical conditions. Safety requirements including biosafety level. Growth and maintenance requirements including culture medium (catalog and ordering information), serum (if any), special additives or growth factors, attachment and substrate preferences, pH, temperature, gas phase requirements, medium changing or ‘feeding' schedule, subculturing method and frequency, split ratios and seeding concentrations, and maximum passage or generation number for finite cell lines. Culture history including source of cell lines, species and tissue of origin, gender, age, normal or neoplastic, isolation technique used, passage history (or population doubling level for finite cell cultures), and important literature citations. Authentication of cell line identity. Cell line characteristics including morphology, cytogenetics, surface markers, biochemical functions, protein production, growth curves, doubling time, tumor forming abilities, transformation status, cloning efficiency, applications or capabilities. Images of the cell culture at different densities are very helpful. Sterility and mycoplasma testing results. Freezing history including personnel, date, number of vials, freezing medium (cryoprotective agents and concentration), freezing method, cell concentration, cooling method, recommended thawing and recovery instructions, expected viability. Storage location of both master and working stocks. Location of emergency back up cultures should also be included here. List and contact information for all researchers who have been sent cells from these stocks. This can be very useful if they ever need to be contacted due to an issue with the culture. Using preprinted forms makes the process of record keeping easier and standardizes the process. Permanence and accessibility of the records are best guaranteed by maintaining records electronically (Freshney, 2002). Back up all electronic records frequently and keep at least one copy at another location. Download and print a paper copy at least once a year. Losing all or some of your cell line records or experimental data can seriously impede your research. It can reduce the amount of storage space required by 80% or more. It reduces the number of cells needed to create a master and working cell stock. It provides more flexibility. If the demand for a cell line increases, then the size of the next working stock can be increased accordingly. Establishment of cell bank systems used for the manufacturing of biologicals and vaccines are subject to far more stringent consideration and conditions. In addition, these banks would also need to comply with appropriate federal guidelines (Stacey, 2004). In the end, the quality of your research depends on the quality of your cells. Freshney, R. I. Cell Line Provenance. Cytotechnology 39:55-67 (2002). Freshney, R. I. Culture of Animal Cells: A Manual of Basic Technique. (Fourth edition; Wiley-Liss, New York, 2000) Chapter 19. Hay, R. J. The Seed Stock Concept and Quality Control for Cell Lines. Analytical Biochemistry 171: 225-237 (1988). Hughes, P., Marshall, D., Reid, Y., Parkes, H. and Gelber, C. The Costs of Using Unauthenticated, Over-passaged Cell Lines: How Much More Data Do We Need? BioTechniques 43:575-586 (2007). Shannon, J. E. and M. L. Macy. Freezing, Storage, and Recovery of Cell Stocks. In Tissue Culture: Methods and Applications. P. F. Kruse and M. K. Patterson, Jr. Eds. (Academic Press, New York, 1976) p. 712-718. Stacey G. Fundamental Issues for Cell-Line Banks in Biotechnology and Regulatory Affairs. In Life in the Frozen State; B. J. Fuller, N. Lane, and E. E. Benson; Eds. (CRC Press LLC, Boca Raton, Florida, 2004) p. 437-452. Please call or contact us online us to reach our technical experts at Bionique® Testing Laboratories if you have any questions on the material or require additional information.